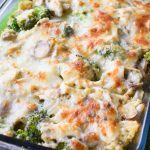 Broccoli Chicken Quinoa Casserole recipe with rotisserie chicken, mushrooms, broccoli and a creamy sauce! I promise you’ve never had quinoa like this! Use cooked quinoa, or cook 1 cup of dry quinoa and 2 cups water or chicken broth in a rice cooker on the rice setting. When the quinoa is done cooking, let it cool for several minutes before adding it to the casserole mixture. Heat olive oil in a medium saucepan on medium heat. Add mushrooms and pan fry until they soften, stirring occasionally. Strain and set aside. Place broccoli and water in a microwave safe bowl or steamer, and microwave on high for 3 minutes. Strain and set aside. In the previously used mushroom saucepan, melt butter over medium heat. Add flour and whisk continuously until a paste is formed, about one minute. Slowly add milk, whisking continuously. Let it simmer while whisking for another 2-3 minutes. Add grated parmesan cheese, whisking continuously. Continue stirring until the sauce is thick to your preference and cheese is melted. Add parsley, oregano, garlic, and red pepper flakes to sauce. Stir until mixed. Combine all chicken, quinoa, broccoli, mushrooms, and sauce in large bowl. Add 1 cup of mozzarella cheese and a dash of salt and pepper. Stir until well mixed. Evenly distribute mixture in a greased 9×13 inch casserole dish. Sprinkle with remaining 1 cup mozzarella cheese. Bake uncovered for 25 minutes. Broil for an additional 3-5 minutes until top is browned. Let cool for 5 minutes before enjoying! Cooking Quinoa: Add 1 cup of dry quinoa and 2 cups water or chicken broth in a rice cooker and cook on the rice setting. When the quinoa is done cooking, let it cool for several minutes before adding it to the casserole mixture. Rotisserie Chicken: I pull all the chicken from the carcass while the quinoa is cooking. Use the carcass to make chicken broth! I’m currently experimenting with that. Recipe inspired by Creamy Chicken Quinoa and Broccoli Casserole by Lindsay Ostrom at Pinch of Yum! I have never made Lindsay’s recipe, and our recipes do vary greatly; however, I have to give credit to the original inspiration for quinoa in a casserole!